“By focusing on what customers want, the magic happens,” says Craig Miller, Managing Director of AluFoldDirect. “Our customers stay with us because we have given them confidence to sell and install aluminium. Knowing that many of our customers were used to turnaround times on PVCu windows and doors, we reduced our delivery times to one week unglazed, two weeks glazed. This meant that the aperture could be built, which meant more doors were measured and installed right first time. 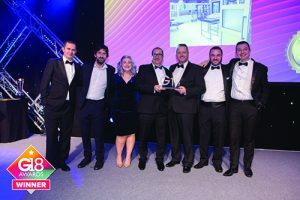 “It’s no surprise that Fabricator of the Year and the Training and Development awards come hand-in-hand. Initially the training academy was for our team members, creating a skilled workforce to fabricate aluminium doors and windows. Expanding the training to customers for fitting has given an unprecedented level of support to customers. Our training manager Paul’s diary is chock-a-block with customers coming to the factory. Paul offers hands on training to give confidence to customers installing aluminium. Whether it’s for tips and hints for specific products for experienced installers, or in-depth training sessions for fitters. There’s no classroom, this is practical ‘get your hands dirty’ training using the specially built rigs in the factory. We believe if you can for PVCu, you can install aluminium with the right support. “The results speak for themselves,” adds Craig. “AluFoldDirect has shown unbelievable growth since we first started in 2014. This year’s turnover is £11.3 million and much of that comes from customers having the confidence to install more aluminium and ordering from us. We have made aluminium easy, what used to be a niche product has become mainstream and everyone wins. Expanding the range means we have more products for installers to offer, and they know that they get the same level of service across the range.